Sinusitis in general terms is defined as the swelling or inflammation of the sinuses. The sinuses are small and narrow cavities or spaces that are filled with air just above the eyebrows and behind the face bones. They generate mucus which cleans the bacteria. About 90 percent of people are attacked by this condition atleast once in their lifetime. In most of the cases Sinusitis is caused by infections. Virus, bacteria and streptococcus bacteria are the common reasons for causing sinus infections. This disease or condition can be treated by taking medication and by increasing body immunity recurrences can also be prevented. 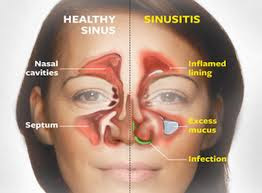 Sinusitis can occur in any season but in some countries it is more observed in winter and rainy seasons. It is also associated with cold. It can occur in people of any age. There are commonly 3 types of sinusitis. The studies have found that this health condition is one of the most common health conditions that leads to surgeries. There are primarily four types of sinus. The symptoms of sinusitis may be different in each individual, it depends on the age and other factors. If any of the following symptoms are observed frequently or if they last upto 10 days a medical check up is advised.